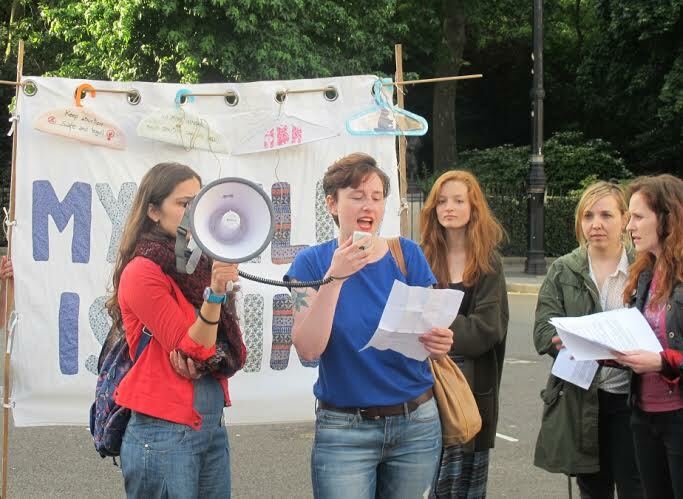 Yesterday, 27th of June, 2014, My Belly is Mine, in collaboration with Irish prochoice activists Speaking of I.M.E.L.D.A and the Spanish Women’s Assembly from the 15M movement, protested at the Spanish Embassy in London against the antiabortion law that the Partido Popular are attempting to pass in Spain. 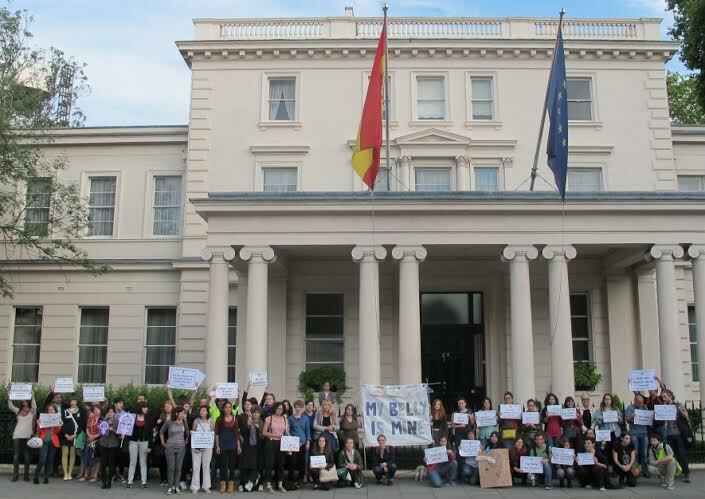 We have come together at the Spanish Embassy in London to protest the regressive antiabortion law that will soon enter the Spanish parliament. And we are not alone! Prochoice campaigners stand shoulder to shoulder with us today at this very moment in time in Berlin, Vienna, Lisbon, Marseille, Lima, Montevideo, Florence, Paris, Reggio Calabria, Bordeaux, Madrid, Las Palmas, Coruña, Murcia, Alicante, Almería, Cáceres, Barcelona, Ourense, Pontevedra, Santiago de Compostela, Tenerife, Vigo, Oviedo, Valencia and many more will be protesting over the next few days. We are the majority and we know that we are on the side of democracy and human rights. 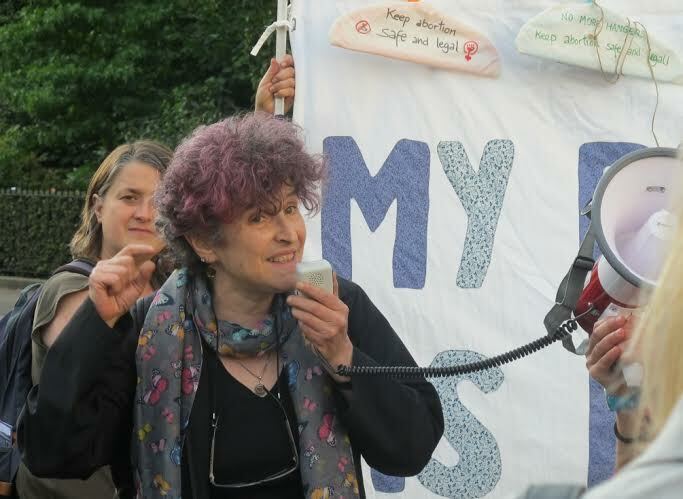 Bea from the Women’s Assembly reads the joint statement in Spanish. Just as we knew would happen, the Spanish government has waited until the summer holidays to pass the new antiabortion law, as quietly and as surreptitiously as possible. In a week, the bill begins its parliamentary process to eventually become law: it will be a law that means no Spanish woman will be able to make decisions regarding her own body and motherhood. 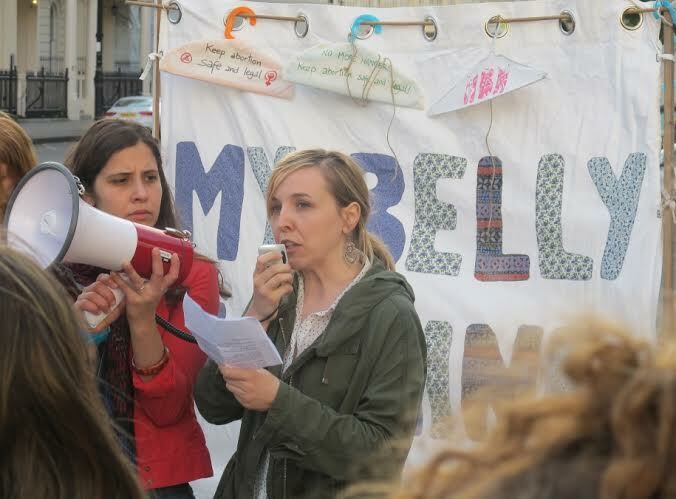 Cristina, from My Belly is Mine, reads the joint statement in English. This law is even more reactionary than the one passed by the socialist government of Felipe Gonzalez in 1985. 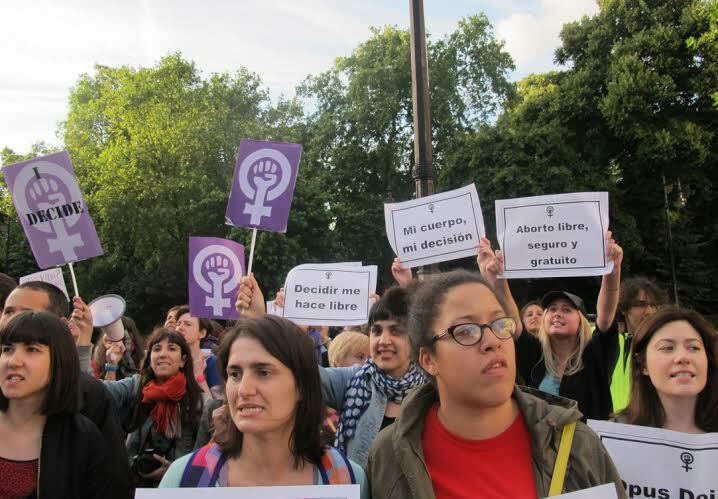 It takes Spanish women’s rights back to the time of Franco, to the time of clandestine abortions for the poor, lonely trips to London for those who had the money or managed to scrape the money together and forced motherhood for those who don’t have the strength or time for lengthy and tortuous bureaucratic procedure. This is a law that nobody asked for. A law that the overwhelming majority of Spanish citizens said they did not want. There has been one tiny concession by the Spanish government: fetus abnormality will now be accepted as a reason for termination. With this concession, the government wants us to believe that it is willing to engage and negotiate. We are under no illusion. We see this fascist government for what it is. We know that even in the case of fetal abnormality, women will be subjected to humiliating medical bureaucracy intended to show them that they are not allowed to decide what happens to their own body. The Spanish Women’s Assembly, My Belly is Mine and Speaking of I.M.E.L.D.A have come together to protest this law from the United Kingdom. We are proof again of the historic solidarity that has existed between British, Irish and Spanish women. British women have always welcomed both Irish and Spanish women onto UK soil for their terminations. Irish and Spanish activists fought together in the 80s just as we are doing today. 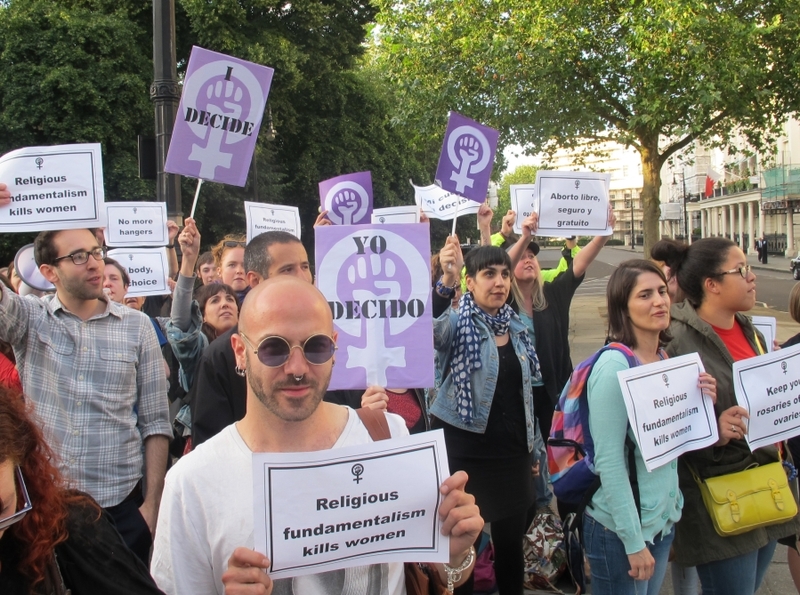 We are well aware this law is not just a result of the Spanish right or the Spanish Catholic Church, but in times of austerity, women’s rights are always eroded, and they are forced into the role of housewife and mother. This happens to women everywhere, not just in Spain. We are going to protest all this summer in London. We are distributing leaflets with our contact details. We are also taking down email addresses. Please join us to oppose this law. We must show the Spanish government that we will not allow this law to pass without opposition. They may use their majority in parliament, but we will use our majority on the streets to fight tooth and nail to defend the rights of women. Isabel is living proof that we can never take our rights for granted. 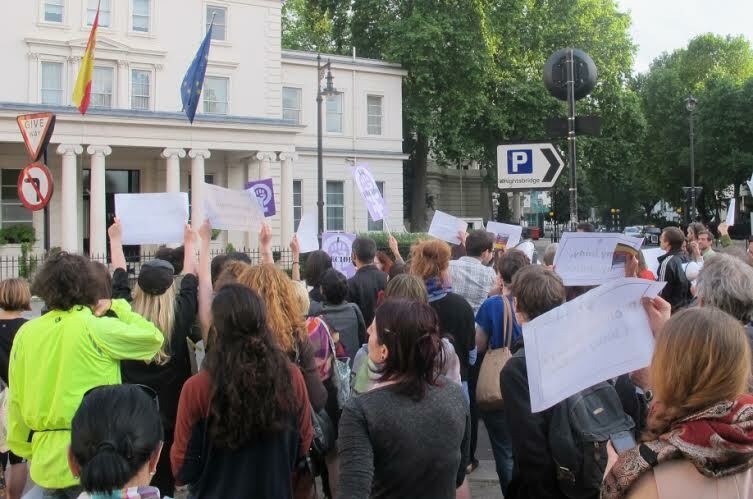 Indeed, the SWASG assisted women from Spain during the 80s who came to London to seek abortion. Furthermore, SWASG collaborated with the Irish Women’s Support Group (IWASG). 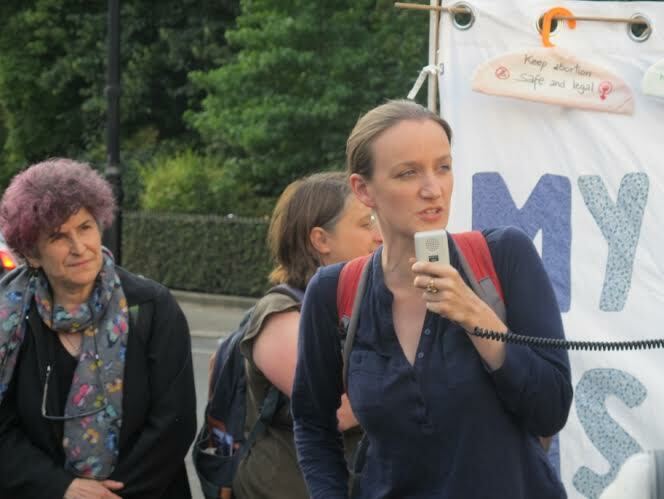 Comedian and activist Kate Smurthwaite addresses the crowd. Gallardón went even further when he accused the Socialist Party of discriminating against women by considering them “criminals, as opposed to victims” since under the 1985 and 2010 Socialist abortion laws, women could face prison sentences. He concluded that the draft bill will have a positive gender impact as it will remove financial penalties and prison sentences for women who abort. Elena Valenciano called Gallardón “public enemy no 1 when it comes to Spanish women’s freedom” during yet another face-off with the Justice Minister in parliament in which she also claimed Gallardón was attempting to curry favour with the more conservative faction of his voters and party at the expense of women’s reproductive freedom. 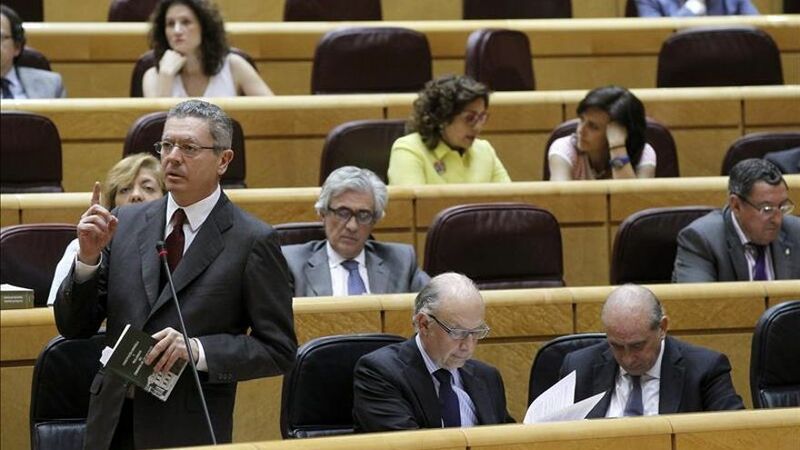 Socialist MP Eduardo Madina spoke for the nation when he told Gallardón: “Do not listen to your party, listen to the Spanish people and tell us that your law will be no more“.